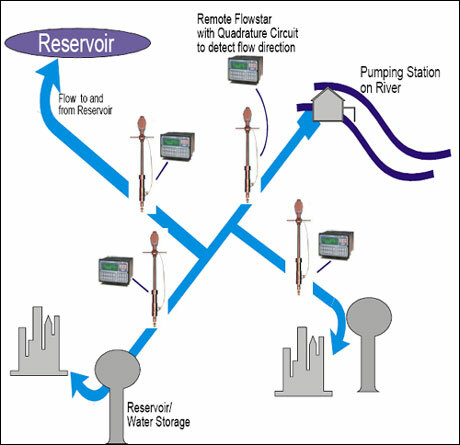 Accurate and cost effective flow monitoring for municipal water inventory control. Because of their wide geographic coverage and large amount of reservoirs and pump stations, the water utility needed to account for water moving between many user systems. Because of the movement of water back and forth, a bi-directional solution was needed. Flowmeters were for use in 62″, 60″, and 36″ lines. Needed to be bi-directional to account for system usage. Needed to provide a “split” 4-20 mA output signal with 12 to 4 mA representing reverse flow and 12 to 20 mA representing forward flow (this was a requirement of their DCS system). Flowmeter portion of system had to be capable of immersion in a flooded pit (electronics to be located remote). Output from flowmeter was required to transmit over 500′ without any signal conditioning. Hoffer HP Series bi-directional insertion flowmeter. 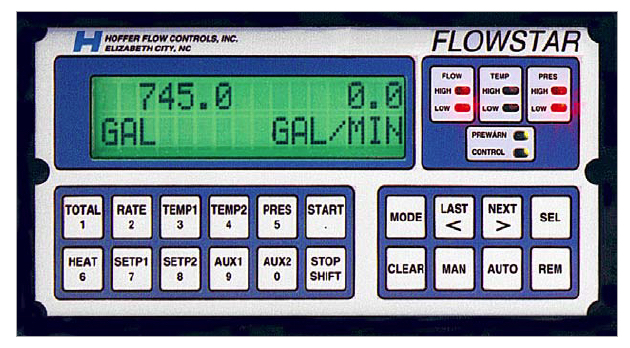 Bi-directional, adjustable insertion turbine flowmeters (from Hoffer Flow Controls) were provided. Each meters included a 2″ rotor in order to obtain repeatable flow rates as low as .25 FPS. The flowmeters are equipped with 2 magnetic pick up coils oriented 90 electrical degrees from each another. All outputs were sent to a remote Flowstar Model 2000 which included the quadrature bi-directional detection feature and a split 4-20 mA signal, used to detect forward or reverse flow rate. 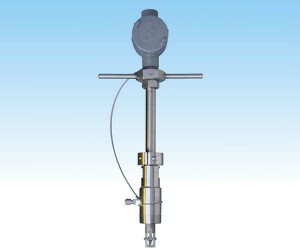 A single Hoffer flowmeter was usable for bi-directional flow measurement. A Hoffer flow computer provided a split 4-20 mA signal representing both forward and reverse flow rate. A Hoffer flow computer could provide linearization over the wide repeatable flow range provided by the insertion meter. This was critical because flow rates were low relative to the line size. The Hoffer flowmeter was water tight, allowing for the possibility of flooded pits. The Hoffer flowmeters are the adjustable type, and are installed through an isolation valve to allow user to service the flowmeters when necessary. The use of Hoffer HP Series bi-directional insertion flowmeters provided the user economical flow rate/flow total information that efficiently enabled the water utility to manage the potable water throughout the system.